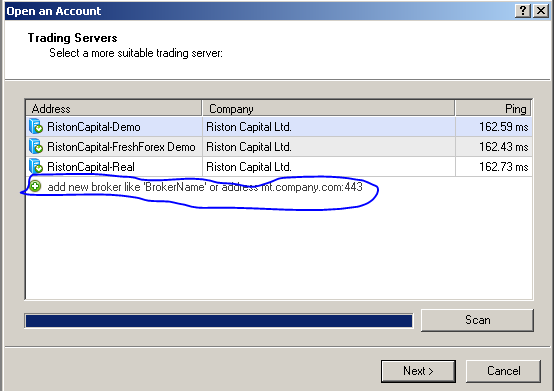 Is there anyone who can tell me how I can change from one broker to another in the same instance of MT4? I have tried tools/options/server and if I put in the new details, it just loses the connction. You will never could do that guys..
Each broker have their own meta4..
Just leave your current broker and open an account in the broker you want to switch. That's all. Or you can trade with 2 brokers at the same time. I have the guide to customize MT4 for trading multiple broker but it's my local language, if you need can contact me and I think Google translate can help in this case. I wonder how a broker platform allowing trader to trade other broker simultaneously. And why they have to forbid that? I have a right and freedom to sign up and trade with several brokers of course if I don't try to avail of latency advantage which is common thing why arbitrageurs are banned on forex.